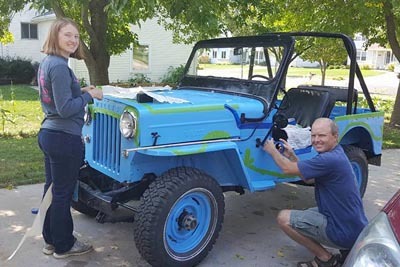 Everybody, especially kids, love Tim McCune's 1958 CJ-3B in Stoughton, Wisconsin. 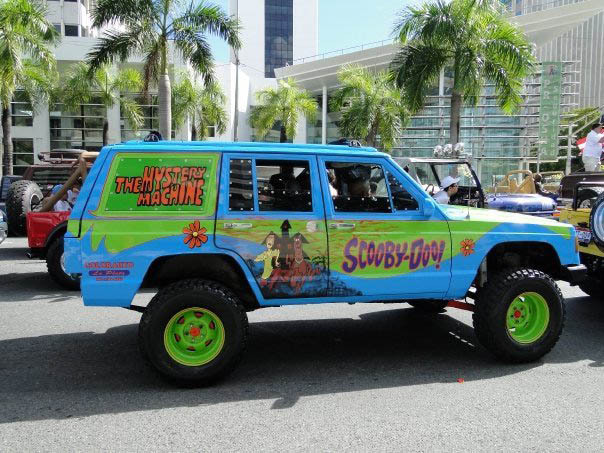 The Jeep's paint job was inspired by the "Mystery Machine" van in the Scooby Doo animated TV series. 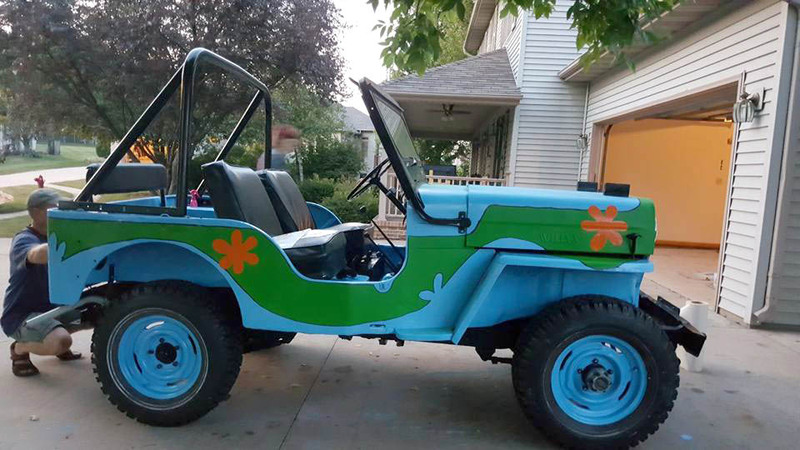 Lots of Scooby fans have painted their vans to look like the Mystery Machine, and even at least one Jeep Cherokee (90K JPEG), but this has got to be the first CJ-3B to get the "Scoo-B" treatment. 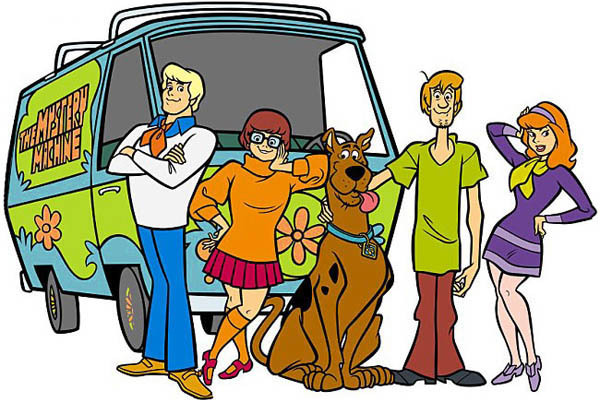 For those who may not be familiar with it, Hanna-Barbera's classic animated series Scooby-Doo, Where Are You! ran on CBS-TV from 1969-75 (Wikipedia). It followed the adventures of four teenagers known as "Mystery, Inc." as they solved supernatural mysteries with their dog Scooby Doo. The characters were inspired by the four teenagers in the landmark early-60s sitcom The Many Loves of Dobie Gillis , and the idea for their Great Dane's name came from Frank Sinatra singing "doo-be-doo-be-doo" in the song "Strangers in the Night"! 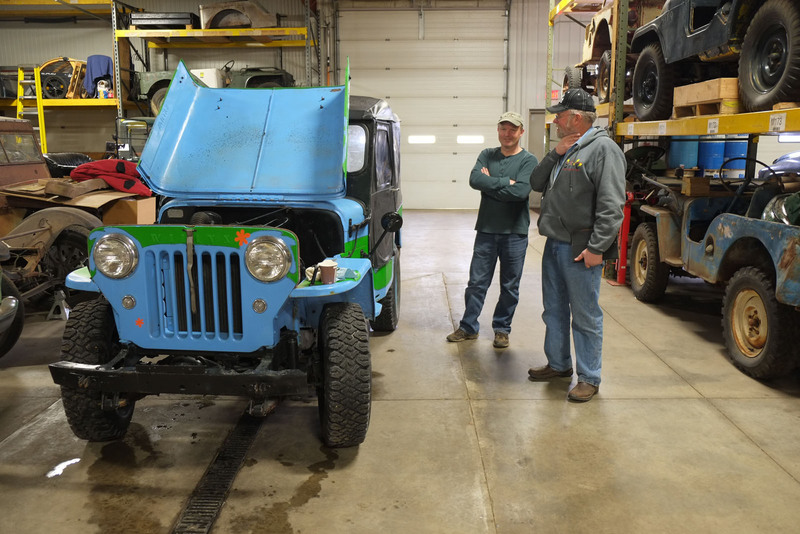 I first heard about the Scoo-B when Bob Christy sent some photos he took of Tim and the Jeep at the 2019 "Jeeps in January" Willys gathering, organized through the CJ-2A Page web forum. 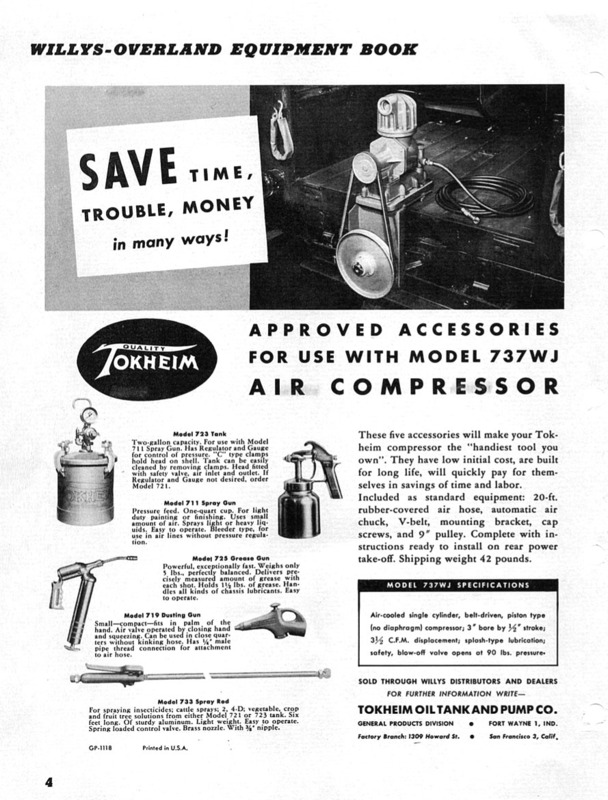 It took place at Joe DeYoung's shop in Madison, Wisconsin, not far from Tim's place. I thought this was a story that had to be shared! 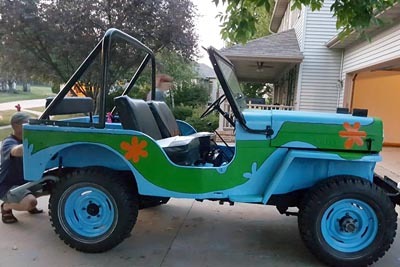 As a matter of fact, lots of Jeeps popped up in the Scooby Doo series. You might remember the team standing around figuring out what to do with this one, which turned out to be remote-controlled, in the "Spooky Space Kook" episode. 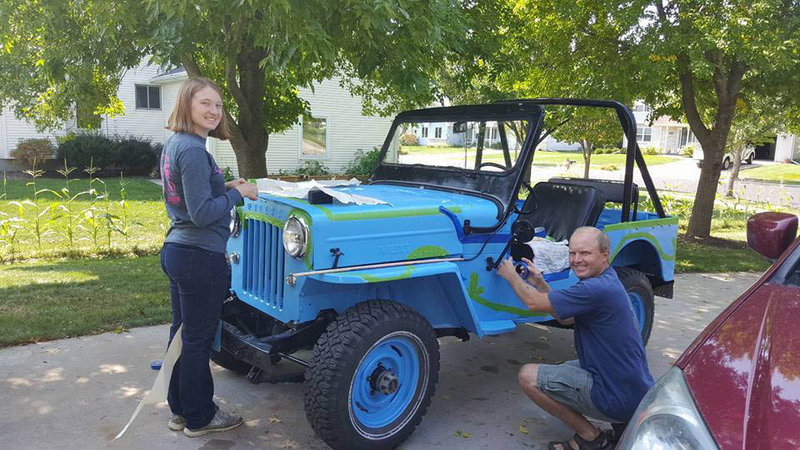 Well, one day Tim McCune and his daughter Erin were standing around figuring that the old '58 3B they called "Willameena" needed some sprucing up. 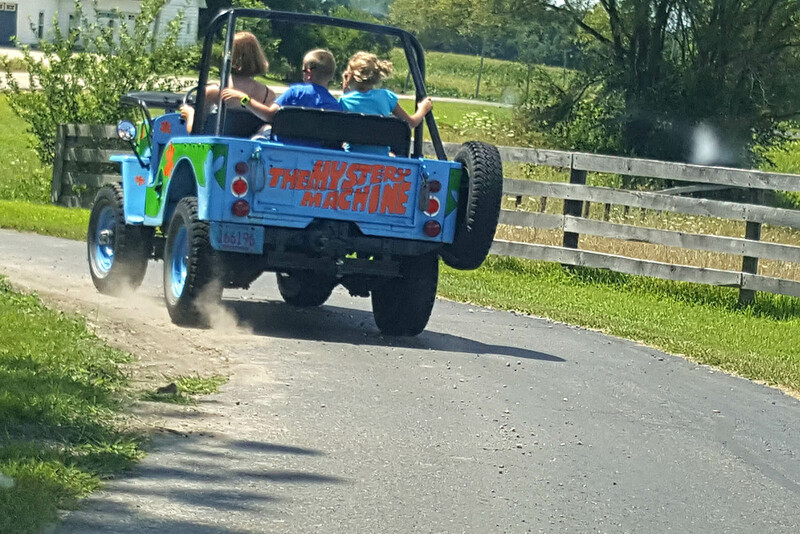 Erin had grown up watching Scooby Doo , and it was her idea that Willameena could become their own Mystery Machine. 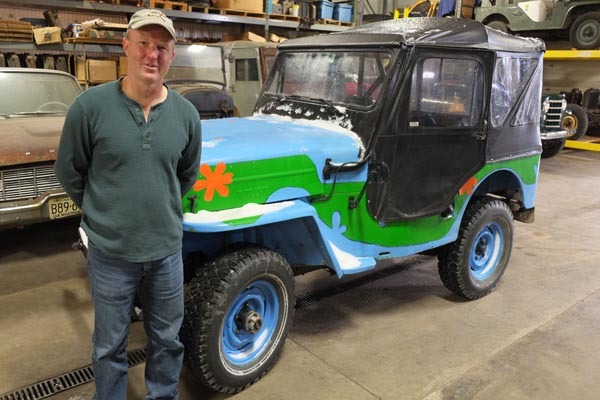 Pretty soon Tim had the body painted Sierra Blue, an original Willys 1958 color (80K JPEG), and they were busy masking off the pattern for some removable green paint. 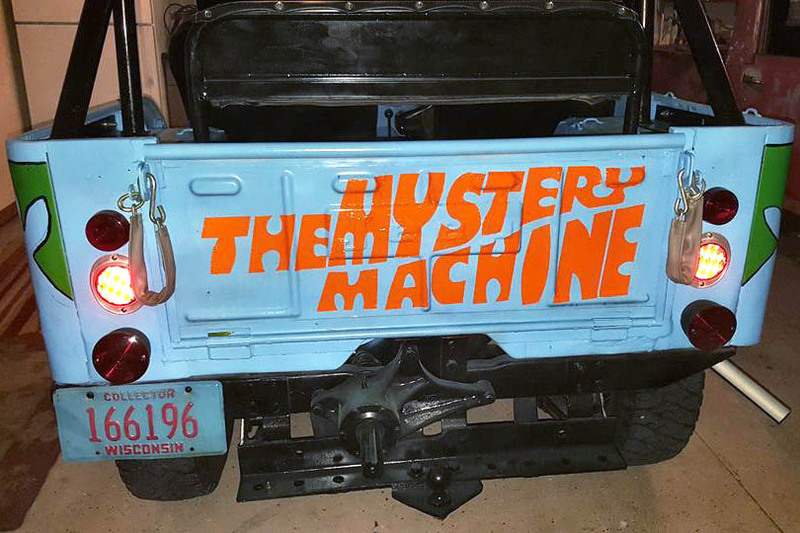 The design was completed with a set of stickers for the flowers and for "The Mystery Machine" lettering, which Tim applied to the tailgate. With the vibration of the tailgate, and the letters applied over the Willys stamping, these stickers didn't actually stay on for long, so Tim ended up having to outline the letters and paint them in by hand. 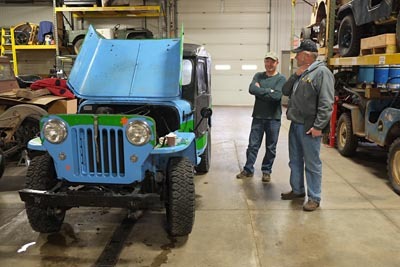 When he brought the Jeep over to Joe DeYoung's shop for the "Jeeps in January" event, the paint job was a hit, but of course people also wanted to look under the hood, and Scott Gilbert ended up taking Tim's carb apart for a bit of cleaning. 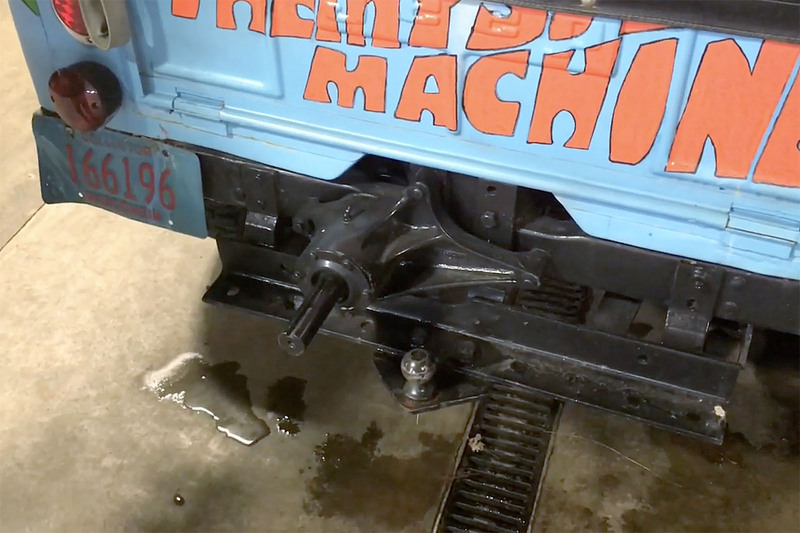 The feature of the Jeep which got the most attention, however, was an unusual 1:1 rear power take-off, which runs straight through from its driveshaft, with no gear reduction built in. Nobody's sure who manufactured this PTO. Could be the same as the unit powering a small compressor (100K JPEG) made by Tokheim (250K JPEG) in the Jeep in Industry booklet. 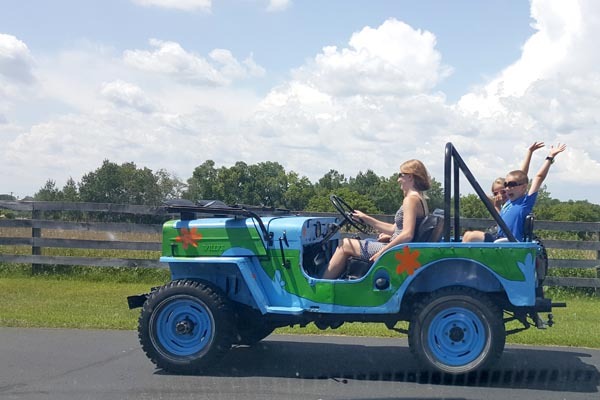 Reports from the previous owner indicate that the Jeep originally belonged to the Virginia Dept. 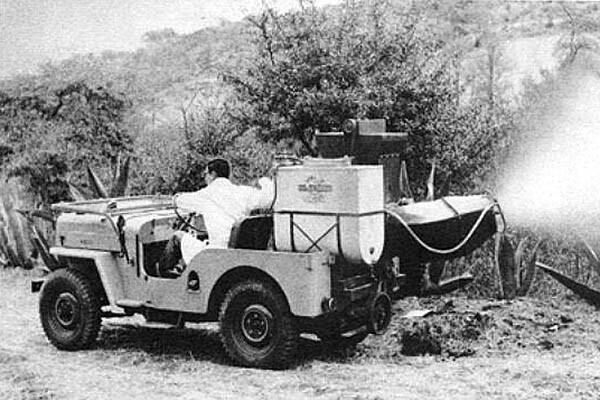 of Forestry, which used it for spraying trees. 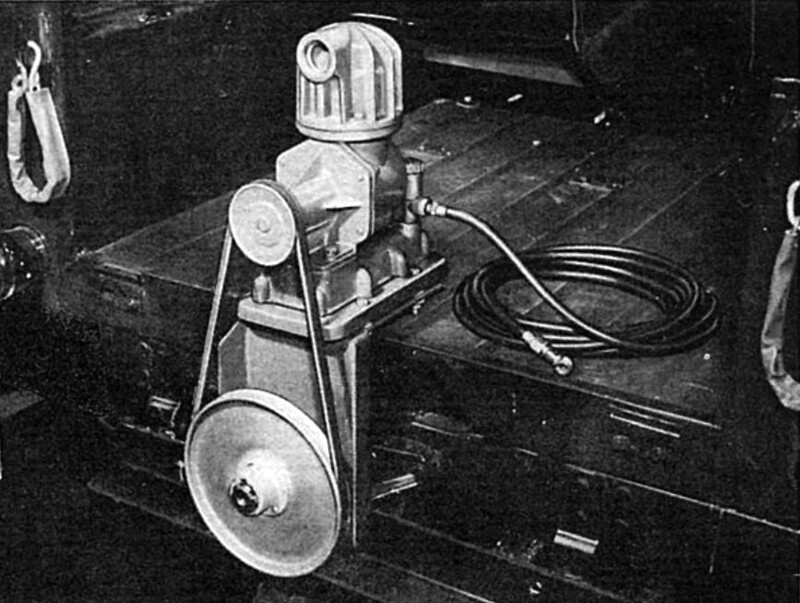 So maybe the PTO was used to power something like this pulley-driven sprayer, seen in the 1955 Willys publication Jeep Vehicles in Public Service . 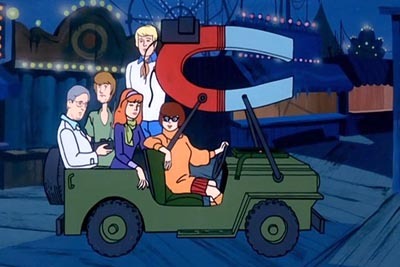 It's a contraption that would fit right into a Scooby Doo episode. 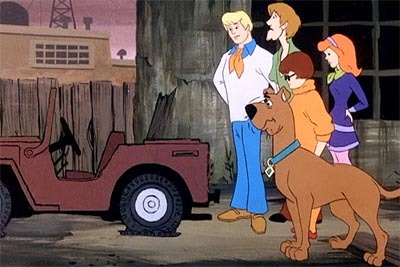 Here's a useful device the Scoobies put together to catch a robot in the "Foul Play in Funland" episode. 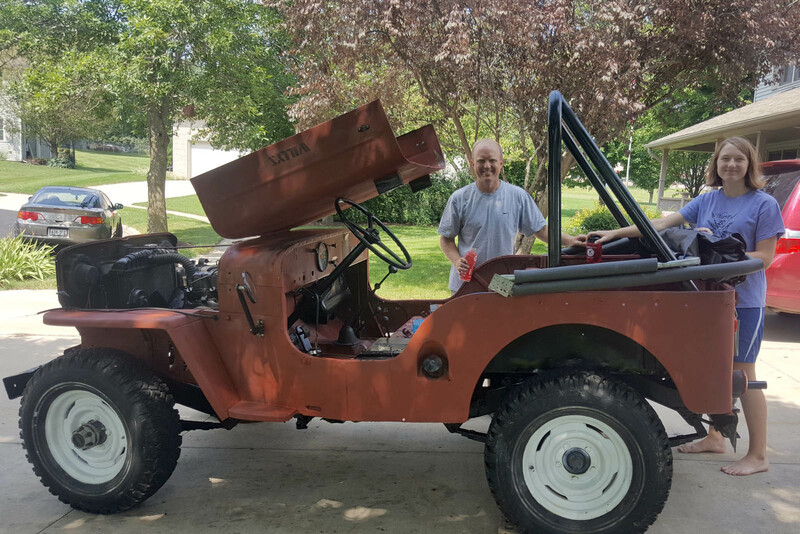 Of course it's mounted on a CJ-3B! 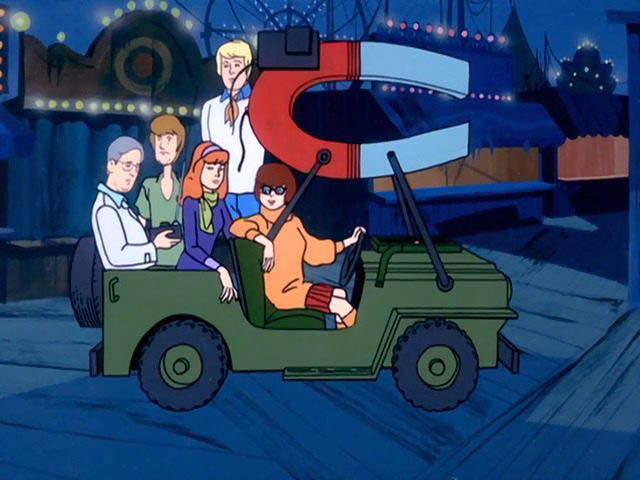 There are in fact enough Jeeps in various episodes of Scooby Doo that CJ3B.info could easily run an article similar to the one where I covered another classic Hanna-Barbera series: Jeeps in Jonny Quest . 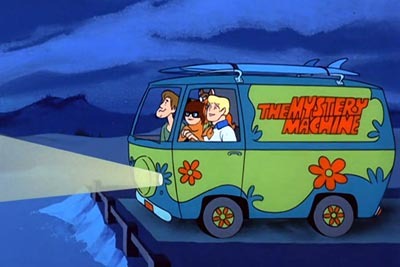 But as far as vehicles go, it's Mystery, Inc.'s "flower power" van that people remember most. It can't really be identified as a particular make or model, although it's often thought of as a Volkswagen van. 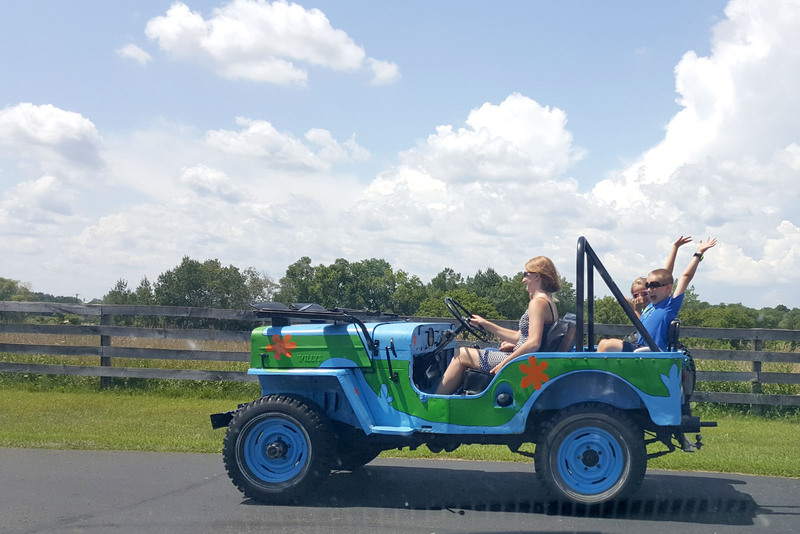 Jalopnik.com covered this topic pretty well in The Mystery Machine Is Not A VW Microbus. 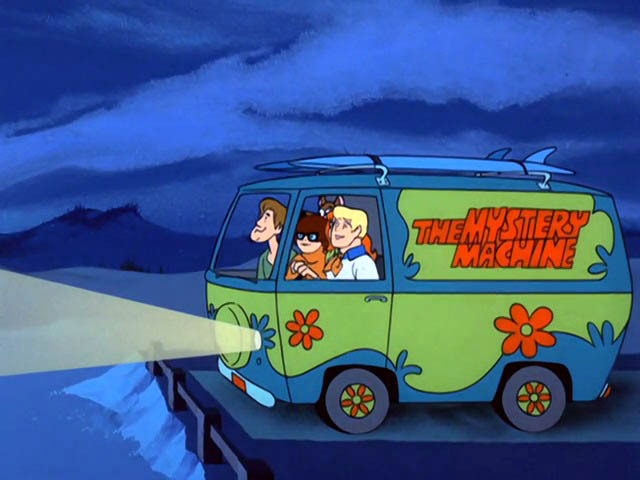 Anyway, excellent job by the McCunes in adapting the Mystery Machine design to their "Scoo-B". 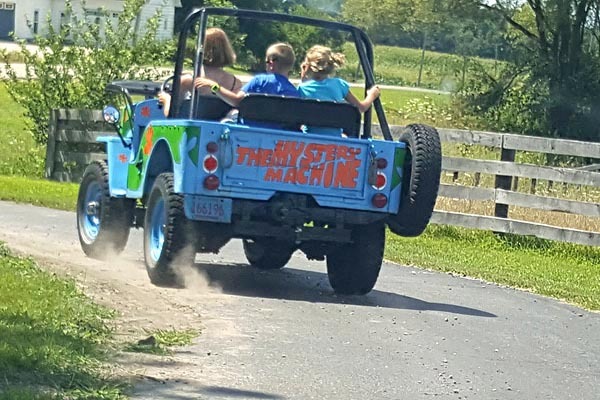 Great vehicle for Erin to take kids for a ride in. 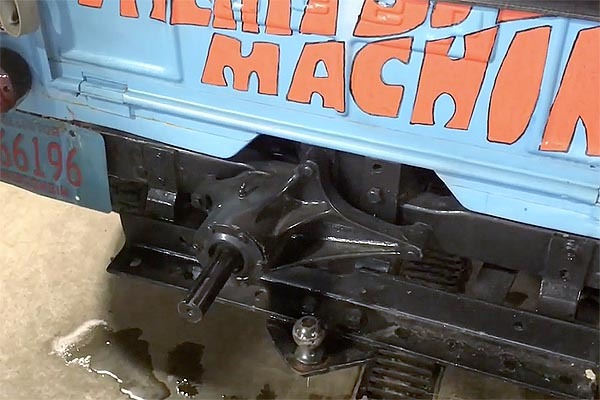 All we need now is for somebody who knows the origins of that oddball PTO, to fill us in. 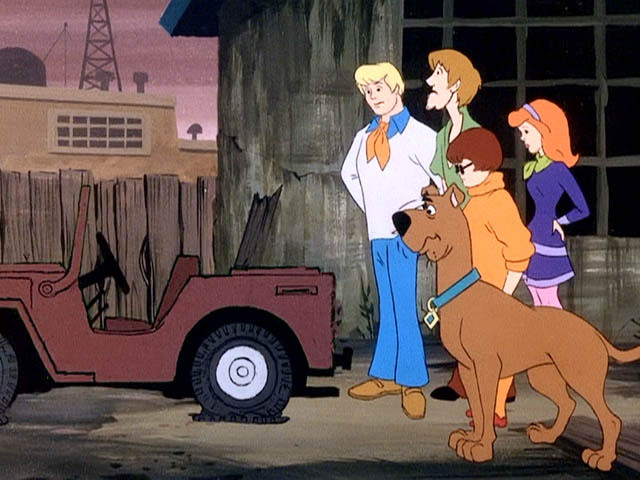 See some Scooby Doo toy Jeeps in Cartoon Jeep Toys, and see also Jeeps in Jonny Quest on CJ3B.info. 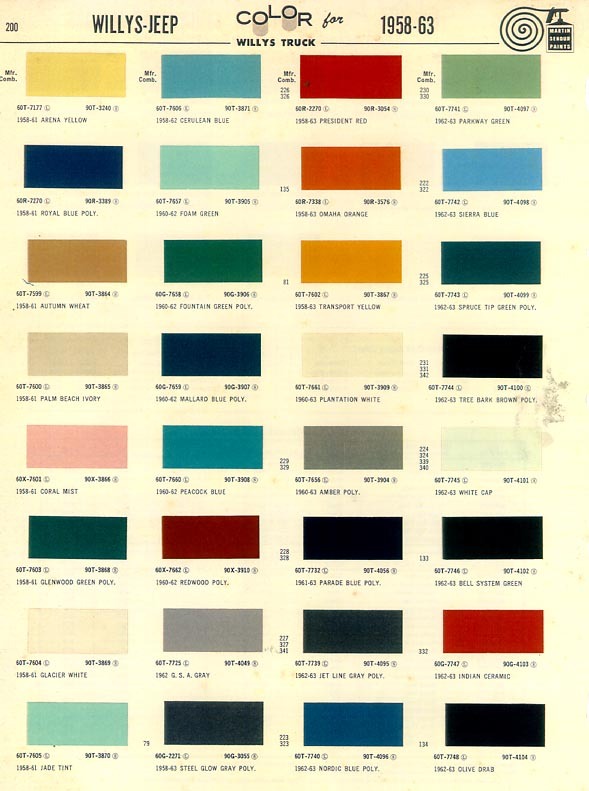 Return to the index of Unusual CJ-3B Photos or see more CJ-3B Owners and Photos.